This new addition to the Compact kit range is to the slightly larger scale of 1/72 to give more working room in the model and to make the kits more suitable for the railway modeler. The details and construction methods used in the craft are the same as in all the kits in the Compact Kit range. 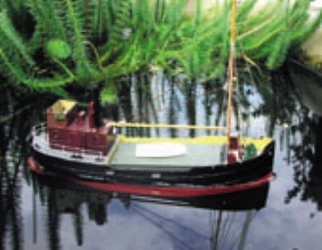 The little "Puffer" is most probably one of the best known small craft in the U.K. Built in huge numbers in every variation possible, some are still in steam today. For a small, "cute" little model that is fun to sail in everything from the garden pond upwards the little Trilight has simplicity and charm in abundance.